Who are you, Simcha Fisher? I am freelance writer and mother of nine. No, wait, a mother of nine, and then a freelance writer. Consequently, I may abruptly vanish from the combox to go make supper or something. So if you spot a post that’s offensive, illogical, indefensible, or just plain stupid, and you question it, and I don’t respond, it’s because I’m just, oh, nourishing my children, that’s all. What kind of name is that, anyway? Hebrew, eh? So then . . . you’re . . .
Roman Catholic. My family converted to Catholicism when I was about 4, and I’m not going anywhere. I consider myself a Hebrew Catholic, as my parents are both Jewish by birth. I’m still sorting out exactly how I ought to be preserving my Jewish heritage, beyond putting horseradish on everything; but in the mean time, don’t piss me off about Israel. Does your husband realize you’re saying these things about him? Yes. He is my final editor before I press “publish,” so it’s cool. He also has a growing entourage of alter egos who look out for him. With all those kids and a husband with several personalities to care for, how do you find the time to write? Sheer, horrifying neglect of duty to God, country, family, and basic hygiene. Hey! You can’t say that about Ron Paul! That’s not a question, but oh yes, I can. I’m offended! I demand an apology! Still not a question, but I’ll tell you what: check your mailbox to find a full refund of every cent you paid me to write this blog. Ha ha! I’m revolted by what I’m reading here, but rather than simply going somewhere else, I’m going to make nasty jokes about your family, the Pope, or the Jews in your combox, okay? Where can I read more of your stupid writing? I blog on Tuesdays, Thursdays and Fridays at the National Catholic Register, and I sometimes contribute to Our Sunday Visitor, Catholic Digest, and this-a and that-a. I will be releasing my first book, The Sinner’s Guide to NFP, in ebook and audiobook form in 2013. How can you call yourself a Catholic when you [insert flagrant and disgusting vice here] ? It’s not easy. Pray for me. Can you give me some advice about this horrible, complicated problem I’m having in my personal life? I probably will if you ask, but why would you? Okay. If you’ve read this far, I’m assuming that you really want to get in touch with me, and aren’t just going to fire off some choice insults. You can reach me at simchafisher [at] gmail [dot] com, and I will do my best to get back to if I can. Sometimes I never get back to you, and I feel bad about it, but that’s just how it is. Aren’t you also a speaker or something? So what is for supper? I just wanted to (okay, I have to stop giggling with excitement that you are blogging again) okay, start over. I wanted to comment on honoring your Jewish heritage. I was born and raised Roman Catholic and I’m sure somewhere waaaay back, probably on my Polish grandfather’s side there is some Jewish blood, but I can’t be sure so I in no way claim to be “ethnically” or any other way Jewish. However as a Catholic I have been brought up to believe that I am a spiritual descendent (isn’t that a nice term) of the Jews. So, as I became an adult, this became more important to me. I married a non-commital-confused Protestant who agreed to raise our children Catholic but was even more confused when I told him I wanted to celebrate Chanukah and Pesach and Purim etc. I explained that Jesus was Jewish, as I’ve found a lot of Protestants were not aware, and then I went on to explain that Christian traditions such as Pesach were built off of Jewish ones. Anyhow, at our parish, coincidentally, our priest became close friends with a local Rabbi who offered to do a Passover Sedar Meal as a fundraiser for our parish. So, we went, and we fell in love (with the tradition, we were long married at this point). So we are now committed to teaching our 3 children the legacy of Christianity not only through mass and the sacraments etc but through Jewish traditions as well. I know, it’s very weird. But, what’s even weirder, Margaret Cabaniss and I made our first communion together and were student youth leaders together and graduated together. And she’s not near as kooky as I am :). Ok, I meant to say the Eucharist derived from Passover/Pesach. Forgive me, I am working nights and sleep deprived. I saw this on a clip from Late Nite Catechism 2. Judaism is “American Graffitti,” the Catholic Church is “Happy Days,” and Protestants are “Joanie Loves Chachi.” I hope you find this funny but not offensive. I thought it was hilarious, but I’m Anglican. Nice to meet you! I’m a Jew married to a Catholic and raising the kids Catholic. But I would probably piss you off about Israel, iconoclast that I am. I didn’t read you before (new to blogworld) but I am very excited to start!! Please forgive my ignorance, but would you explain why Israel might trigger you to lose your temper? Are you for or against? Thanks. Simcha, I’ve been raising my three kids in the Hebrew Catholic congregations here in Israel for the last 5+ years, having converted from Evangelical Protestantism after moving here 8+ years ago. We are Gentiles but are so rich in having discovered our roots here. In fact, it was being in close contact with Judaism that brought us home to the Catholic faith. Anyway, tickled to have found your blog via Conversion Diary. I’ll be back often, although I’m terrible about not leaving comments because my time online is so limited! The baby shower post had me laughing and snorting in agreement (among others!). Nice to meet you! Laura and I have always called you “Sim-cha”, and have decided we never want to meet you in person because it would be too hard to change. So grateful you’re blogging again. I was so bored with the internet I was almost considering catching up on house work, or a real book. Thank heavens I can chuck that idea. Delighted you’re back. Is there any chance you could re-publish your story on defrosting the hamburger in the washing machine. A very good friend of mine is about to have her 4th child and I would like her to have a fabulous laugh. That story, which I passed along a lot when your old blog was up, has kept many friends laughing over their life with a newborn mistakes, “Well, it wasn’t quite hamburger in the washing machine but I ……”. Thanks, Jane! I would love for an excuse to recycle some old posts – look for it in the next week or so. Oh, really?! Too bad you didn’t think that way freshman year of college when your roommate’s way-too-perky friend was trying to pronounce it phlegm-free and you wouldn’t let her off the hook! My husband and I think we were at a wine tasting with your cab-driving Phoenician brother in May…did he teach at a school called Teleos last year? If so: crazy! If not: whatevs! Yeah, that’s him! How funny. Are comments really closed on the pants issue? I had a long response (going against what most people wrote) formulating in my head and somewhat written down but I don’t want to take the time to write it out (I am a new first time mom of a 6 week old who is quite sleep deprived as I am sure you can understand) if it won’t be posted. While there were zillions of comments I think most were quite emotion driven (it seems that most just are on one very extreme side or the other and are quite passionate about exclaiming the praises of it) and I was hoping to post some (hopefully) less emotional thoughts as I am have spent an insane amount of time thinking about this topic over the last few years. Anyway, please let me know. looks like you have a great blog here! oh and I just love your first name, I think it is beautiful! Just found your blog thru Cheeky Pink Girl. Love it! This is great! I am a freelance writing half-Jew who is, also, a cradle Catholic. Great news to know there are others like me:) I like this idea of an FAQ as well. Hi, just found your blog. I’m perusing some older posts, and you are making me laugh today when I needed some cheering up. Thank you! I also have a Hebrew name which gives people fits — Zipporah. The Marine who visited my high school to give me an award at seniors night refused to even try to pronounce it. And, no, it’s not pronounced like “zipper” thanks. And if one more person thinks it’s cute to call me Zippy, I will throw up in their shoes. But my favorite rendition is a 4’10” hillbilly girl I used to work with at Walmart for 3 years who insisted on calling me “Zenobia”…Huh? Gah! Dude, I had a name tag and everything. I love your blog. A friend sent me your post in rebuttal of that hair-brained anti-pants article and I was laughing so hard I had tears streaming down my face. (Those are all the reasons I LOVE PANTS too!!) 🙂 Thanks for the laugh — I sure needed it today. It’s fun to see a fellow NH Catholic writing about things so near to my heart! Knishes. Especially carrot knishes. Matzoh ball soup, where the matzoh ball is the size of a gorilla’s fist and hot all the way through because it’s been in the soup all the time. Oh, and brisket. Lots and lots of brisket. Would charoset be a bridge too far? My cousins’ Jewish grandmother loved, loved, loved me, because I’m 1) smart 2) a voracious reader, and always have been 3) a Mediterranean-Slav hybrid with curly hair and glasses 4) religious (even if it wasn’t quite the right religion, in her eyes) 5) a boy, whereas her own grandchildren were all girls (believe me, she spoiled us all, but, you know, the one boy she had); ergo, I became her Jewish grandson. Ay-yay-yay how she would spoil me! And such naches when I did good at school. Seriously. Where is the forsaken donate button?! Hello Simcha, I am what you could call a cradle Messianic Jew (dad Jewish, mom Gentile, both believe in Jesus and together pioneered forms of Jesus-faith which sought to preserve and honor Jewish heritage and identity). I was aware of the Hebrew Catholic community in Israel. To me, not only does it make intuitive sense that a robust faith in Jesus should play well with a robust Jewish identity, but the presence of Jewish faith in Jesus testifies to God’s faithfulness (Jeremiah 31:35-37; Romans 11, etc.). Anyway, I hope to read your blog more. Shalom. Seen your name around the Catholic/Christian blogosphere and now I know who you are. Interesting. This might be fun. I love nitpicking misinformation and disinformation especially about Jews and Israel so you have been warned people! First a general question: Do the Hebrew Catholics have a central organization to contact for info? Now first nitpick: Tiffaniv – ain’t no such animal as a ‘half-Jew’, you either is or you isn’t a Jew. As King Solomon proved, you don’t cut a Jew in half! Once had to correct a ‘know-it-all’ Catholic bookstore lady who said King Herod was a ‘half-Jew’. People make the mistake of thinking Jews are ‘race’ which we are not. We are a ‘people’, ‘a nation’ made up of many ethnic groups of one race, the “human race”! Different ‘colors’ do not a race make, they are all of the ‘human race’ and segments of all these different groups are a part physical Israel, the Jewish people and nation. On the other hand, as a Rabbi once said, if you are crazy enough to want to be a Jew and claim to be a Jew, then you are a Jew and welcome to the tribe! MAZEL TOV! We’re (yes, you & I personally) are in BIIIIIIG trouble. Please respond. I can be whatever I want. Not that the details are your business, but my mother’s mother is a Jew by birth and my father’s mother is a Jew by birth. No one is practicing. My stepfather raised me Catholic and I converted to Eastern Orthodoxy. Not quite Jewish, but my ancestors (and my grandmothers) are. The debate of what makes a Jew (or half of one) is an old and mostly insulting argument. I am also partially Irish and Russian. I even speak Russian and can bake Soda Bread and make borscht. My Jews are mostly Hungarians and Germans with a few scraggly geographic Poles. Lots of people tried demanding that they where symbols to define their cultural and racial connection. They didn’t appreciate it, so for my safety, my grandparents stopped calling themselves Jews. I am an Orthodox Christian and I bet my grandchildren will know nothing of my Semitic ancestry and if they discover it and announce – even in passing – some know it all will correct them for it. I meant to write in “I have to poop” in the Google search box, but was directed to your site. However, your blog is very relevant to what I was searching for. Just a quick note: I haven’t read through all of your pieces. From some of the things I see I believe we may have differing opinions on some issues. Having said that, I think you are an amazing writer. Your piece written to the mother of one child came to me like a gift from God when I needed it the most. Thank you for being so brave and smart, and for writing down everything I am/was feeling. I’ve followed your writing at NCReg. for a while now and only just found out you live in NH also! As a resident in the Lakes Region you’ve made me proud! Between you and Danielle Bean, who writes for Parable, the magazine put out by our Manchester Diocese and her blogs, lowly NH has been put in the spotlight! 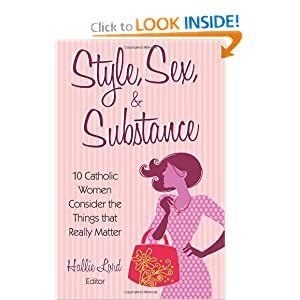 I enjoy your style of writing as you describe Catholic life with a unique perspective. Thank you and I hope you continue writing for a long time to come! you are hilarious…thanks, I needed that…I am Italian with the catholic background but do not adhere to any particular religion. I know this, that because God made me, I KNOW He has a sense of humor and you are just further proof. Can you say Shalom while genuflecting? I am a traditional latin mass going Catholic, I enjoy your blog and articles. As a professional writer, I am amazed you can find time to think up articles and write as often as you do. No one wants to hear what I have to say on anything, so my writing is just propaganda for my company,,,, oh I forgot its now called “corporate communications”. You’re so nice! Revamping this blog is #2 on my to-do list – and I think a Paypal button is a splendid idea. Simcha, You have other things to deal with right now, but when you get a moment . . . what is the story behind the fertility-goddess-resting-on-a-La-Z-Boy that you have in the header of your blog? Surely someone other than me has wondered about this too . . . .
me too – I am wondering the same thing! I love your blog. Just read your post on (not) homeschooling, and giggled my way through your FAQ. I’m in a writers group with a bunch of smart Christian women, all of whom are wonderful, but some of whom occasionally take themselves a bit too seriously and need to just, like, chill out. Reading you is just the breath of fresh air I needed today. Thanks for keeping it real–blessings on you and your brood! Thank you for making me laugh, think and remember: it is ok to be real & Catholic! I now read and re-read you. On bleak days your articles act like fuel in the hope tank. Thank you so much!